You are currently browsing the archives for the Chandeliers category. While the chandelier might just be something that you’ve always had in your dining room, it actually has a varied and interesting history. 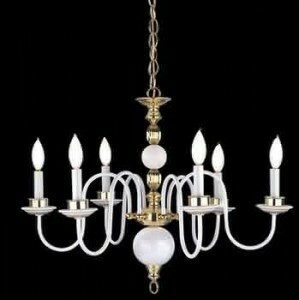 To that end, the first chandelier appeared in medieval times. It was basically a candle chandelier, meaning two pieces of woods were nailed together, and candles were secured to the ends of the wood pieces. With technological advances, the chandelier advanced right along as well. Today, it is typically thought of as a branched and decorative light fixture mounted to the ceiling. No matter what time period they hail from or what region of the world, chandeliers are known for their complex collection of glass and crystal prisms. This often fills the room with vibrant colors and refracted light. Not surprisingly, some of the most decorative and ornate of all chandeliers hailed from France. Famous for their excess and opulence during the era of pre-Revolution Versailles, truly amazing chandeliers were a fixture among the palaces and castles of that day.